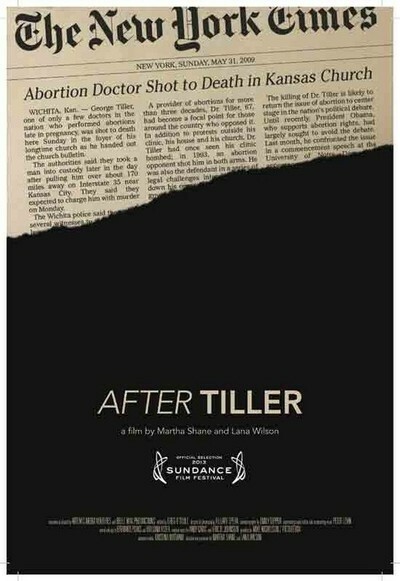 "After Tiller" takes the politically divisive, emotionally charged issue of late-term abortions and portrays it with grace, understatement and humanity. Documentarians Martha Shane and Lana Wilson are clearly on the side of the four remaining doctors in the United States who perform third-trimester abortions, a procedure that even some women's rights advocates find troubling. The directors provide us intimate access to their clinics, homes and family lives, showing us the tears of sympathy they shed with despondent women as well as the ethical struggles they face. These are physicians who care dearly for their patients and view their practice as a noble and necessary calling. Meanwhile, religious zealots are reduced to anonymous images of graphic rhetoric and rigorous prayer. There is no effort to give them anything approaching equal time or treatment, but that doesn't necessarily feel like an omission given that the directors' obvious mission was to put a human face on a complicated topic. Regardless of your feelings on the subject, "After Tiller" makes the dedication of these physicians evident, especially since the title refers to Dr. George Tiller, a late-term abortion provider who was shot to death in 2009 at the Kansas church he regularly attended. Tiller was a mentor and friend to the doctors featured here, which makes his absence especially acute; they mention missing his counsel and company while also recognizing that any of them could be the next target for especially violent and driven activists. As it is, anti-abortion protestors are a constant presence outside their clinics, which operate in the handful of states where third-trimester abortions are still legal. Dr. Warren Hern practices in Boulder, Colorado, where he manages to find time to enjoy the outdoors as an avid skier. He also has a healthy home life as the husband of a Spanish woman he met in Barcelona and a father figure to her young son—but as he points out, that wasn't always the case, as his choice of profession left him lonely for a very long time. In Albuquerque are the film's two female physicians: Drs. Susan Robinson and Shelley Sella. Both live in California—Robinson with her husband, Sella with her wife—but they alternate traveling to New Mexico to keep their shared practice going. At 66, Robinson says she can't imagine retiring because there's too much work to do and not enough OB/GYNs to do it. Finally, there's Dr. LeRoy Carhart, who practices in Nebraska at the film's start but eventually must move to Germantown, Maryland—but not without a fight from citizens and city leaders. Some opponents even go so far as to protest outside the middle school his office landlord's daughter attends. Regardless of pressure or peril, Carhart's wife—who's also his longtime office administrator—remains his loyal partner. The furor this topic generates is amazing given the relatively small number of woman who actually undergo the procedure—which the doctors consider a labor, not a surgery. As "After Tiller" points out, fewer then one percent of the abortions performed in the United States each year occur after the 25th week of pregnancy. But the women who do seek them are so desperate that they're often willing to travel from other states and pay thousands of dollars for them. Shane and Wilson depict the pregnant woman discreetly, never showing their faces but instead focusing on their hands in their laps (often holding crumpled, tear-soaked tissues) and their choked-up voices. As a viewer—and especially as a parent—it's hard not to get choked-up as well, listening to some of the more agonizing stories. One couple knows their baby has a fatal illness and will probably be stillborn, or perhaps live only briefly and painfully. But they still want time to hold the baby afterward, and even have given him a name: Hudson. In stories like these, abortion seems the most humane decision, although it's still a wrenching one. But that brings us to a fascinating debate Robinson wages within herself: whether the quality of the story, or the storytelling, matters in making late-term abortions seem more acceptable. A 16-year-old girl who made a mistake but waited until the 25th week to do anything about it out of fear, shame or denial has as much of a legal right to abort as a woman who decided earlier—but should she? Robinson's decency and candor shine through as she acknowledges her own inner conflict, the inclusion of which provides sharp, thoughtful substance to complement the film's significant emotional heft.